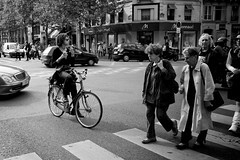 I had a few hours in Paris the other day, between arriving at Charles de Gaulle and departing on the TGV to La Rochelle to attend the national Villes Cyclables [Cyclable Cities] Conference hosted by Le Club des villes et territoires cyclables [The club of cyclable cities and territories]. It's an organisation of hundreds [!] of French cities and regions who are working towards more bicycle-friendly cities and they had invited me as a guest of honour and a speaker about marketing bicycle culture. But before all that, Paris. It was eighteen months since my last visit - far too long for my liking - and I was looking forward to seeing how the city had further developed her bicycle culture. Getting a bike took only a minute or two as I signed up for a 24 hour subscription. I had checked out a couple of the bikes before choosing - testing the brakes and lifting the back end and turning the pedals to make sure they worked. In no time I was on the streets. The problem was that I was in a neighbourhood that I had little experience with. I've been in Paris countless times but never in this arrondissement. I knew that I wanted to go north towards the Seine so that was a start, but ahead of me was a labyrinth of one way streets and traffic as tightly-packed as a hornet's nest. At this point it was much the same as when I was in New York just over a week prior. But the similarities ended there. The very first thing I noticed was the most important. 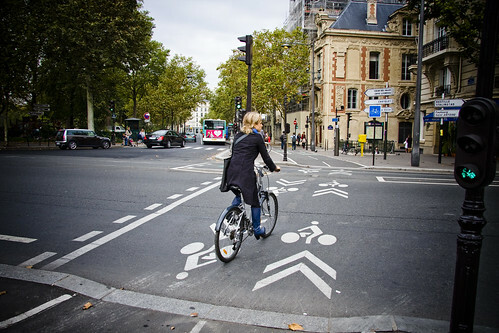 I found that reading and interpreting the bicycle infrastructure - the cycle tracks - was incredibly intuitive. I'm a stranger to the area, I have a vague direction to travel in and yet I was led on my way by a series of quite effective wayfinding tools. The bicycle infrastructure is far from perfect in the city. It is a series of designs and solutions. Many other cities I've been to have made the mistake of implementing too many different kinds of infrastructure so that a person on a bicycle spends half their time trying to understand it and interpret it. Creating a homogenous system consisting of a few effective and easily recognizable designs is preferable. 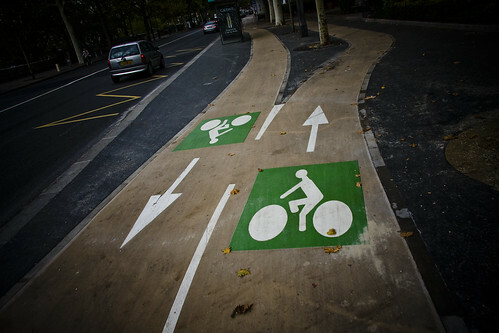 In addition, a streamlined graphic design language for communicating with the cycling citizens is of utmost importance. Just as pedestrians have their zebra crossings, cyclists need signage and symbols directly aimed at them. 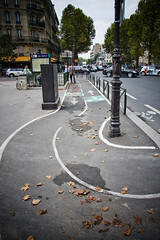 Strangely, in Paris, the blended smoothie of infrastructure was nevertheless workable and this was because of the intuitive graphic design language of the signage. It got me on my way. Being on the cycle tracks also served to eliminate the stress of traffic so it was easier to concentrate on figuring out where to go. The other helpful feature on the urban landscape was a human one. 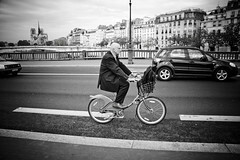 There are many, many people cycling in Paris. By and large, they are just regular citizens heading from A to B. Spotting one up ahead, like in the photo above, was an enormous help. Instantly I could interpret where I should be heading and, if need be, I could follow for a ways. This intuitive aspect was brilliant and was a surprise to me. Once I got into 'hoods that I knew like the back of my hand, it was easier, but still, the wayfinding tools continued to be helpful. Indeed, virtually every person on a bike looked like these people. 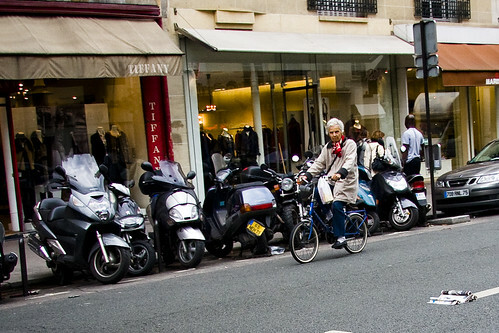 Not their clothes or age, but merely Parisians moving about their city. They could have been on the Metro, a bus or in a car. They just happened to be on bicycles. Paris has it all figured out. 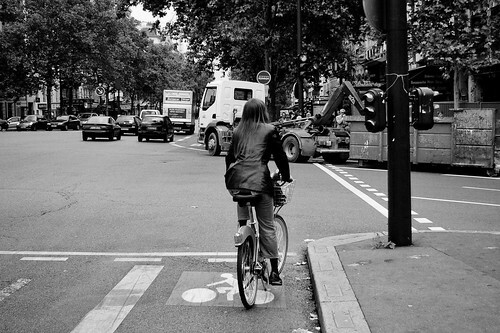 Urban cycling is not catering to a noisy, sub-cultural minority. It is providing the population at large with the quickest way from A to B. Do that, and people will use it. Some of the infrastructure was a bit odd. It is important to remember that it isn't designed for speed demons wishing to 'reclaim the streets' or going for intense training rides. 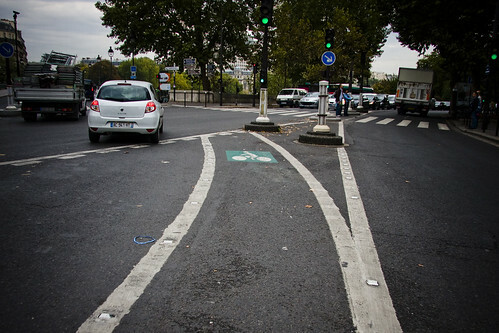 Urban cycling in Paris, like many other cities, is a low-speed affair. Style over Speed. Practical transport over sport. I was surprised, and pleased, that everyone stopped at red lights. They are a respected, accepted and [almost] equal equation in the traffic and behaved as such. And where there were pedestrians, cyclists stopped for them. Especially if they were snacking on a sandwich on their way to B from A. On many routes the bicycles share the bus lanes but there is a vast network of singular cycle tracks as well as, on occasion, dual cycle tracks and inventive intersection solutions. All easy to figure out. One of the main differences between my last visit 18 months ago and now was the fantastic sight of bicycles everywhere. Not just in the traffic but locked to railings and fences and signposts. Two million bicycles have been sold in Paris since the start of the Vélib bike share programme and they are all very visible in the urban theatre. Brilliant. The most remarkable thing is seeing so many people on bikes. From all age and wage brackets. And the ratio of men to women easily matches Copenhagen or Amsterdam. 50-50. For the record I estimate that I saw a few thousand cyclists that day and about 10 helmets - most worn by more sporty types. Seeing so many people moving about their city with ease is the surest sign that people feel safe, not unlike the elderly lady above. And the city will reap the economic benefits of a large cycling population like other cities before her.